We’d love your help. 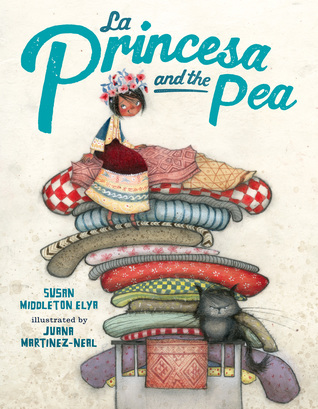 Let us know what’s wrong with this preview of La Princesa and the Pea by Susan Middleton Elya. El principe knows this girl is the one for him, but, as usual, his mother doesn't agree. 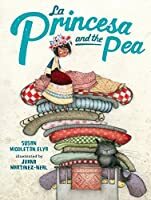 Readers will be enchanted by this Latino twist on the classic story, The Princess and the Pea gets a fresh twist in this charming bilingual retelling. To ask other readers questions about La Princesa and the Pea, please sign up. Loved this author/illustrator team's first book, La Madre Goose, and I adore this new bilingual fractured fairy tale. Fun retelling with a twist, with Spanish words sprinkled throughout, told in rhyming verse. Martinez-Neal's illustrations are stunning and charming, and I appreciated her illustrator's note at the end about the inspiration for the style of the textiles from two specific indigenous groups in Peru! One of my top 5 favorite picture books of 2017. An incredible well written and creative re-telling. The illustrations are some of the most beautiful I have ever come across in a picture book. I recommend La Princesa and the Pea for story time and an wonderful addition to a fairytale collection. Delightful rhymes and wonderful illustrations. A bilingual re-imagination of a classic fairy tale, La Princesa and the Pea weaves English, Spanish, and Peruvian textiles into a memorable story. The story is told in clean, effective rhymes that flow. The book incorporates a Spanish word in most verses, and -- usually -- the word's English meaning can be deciphered from the context of the other words and/or the accompanying illustrations. The book adds more and more Spanish as the story continues. 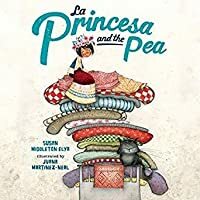 If you're unsure of a word's English meaning o A bilingual re-imagination of a classic fairy tale, La Princesa and the Pea weaves English, Spanish, and Peruvian textiles into a memorable story. The story is told in clean, effective rhymes that flow. The book incorporates a Spanish word in most verses, and -- usually -- the word's English meaning can be deciphered from the context of the other words and/or the accompanying illustrations. The book adds more and more Spanish as the story continues. If you're unsure of a word's English meaning or its Spanish pronunciation, the book provides an indispensable glossary. The illustrations are the kind of soft drawings you feel like you could curl up in, even if there were a rock-hard pea tucked underneath the pages. In tales of fairy there is always magic. It presents itself in varying degrees. These signs of enchantment are woven so adeptly into the main narrative, captivating readers; we suspend belief and accept them as truth. Anything seems possible. In most of these stories royalty figures prominently. The personalities of those in power can range from wise and knowing to downright evil. La Princesa and the Pea (G. P. Putnam's Sons, an imprint of Penguin Random House LLC, September 5, 2017) written by S In tales of fairy there is always magic. It presents itself in varying degrees. These signs of enchantment are woven so adeptly into the main narrative, captivating readers; we suspend belief and accept them as truth. Anything seems possible. In most of these stories royalty figures prominently. The personalities of those in power can range from wise and knowing to downright evil. La Princesa and the Pea (G. P. Putnam's Sons, an imprint of Penguin Random House LLC, September 5, 2017) written by Susan Middleton Elya with illustrations by Juana Martinez-Neal presents us with a queen going to the extreme to make sure the quintessential bride is found for her son. Shifting the setting to Peru opens a door into the beauty of another culture and the opportunity for a marvelous twist on the original Hans Christian Andersen story. A South American take on the traditional 'princess and the pea' story. The story is charming, but the illustrations are a real stand out! From the rich textiles to the deep colors to the amazingly grumpy reina and her cat, every page is a pleasure to look at closely. I really enjoyed how Spanish was used throughout the story, and the subtle cultural changes. What a fun twist to The Princess and the Pea illustrated through the perspective of Peruvian art and culture. As always, the author has inclued Spanish words in rhyme and a Spanish glossary which also add much to this delightful tale. Elya's narrative poems are great models of short stories which include Spanish for all readers. A fun book to revisit! So cute and so fun! So many guinea pigs. I loved the bilingual storytelling and illustrations. Adored this one! And the artwork...wow! Elya, Susan Middleton. La Princesa and the Pea, illustrated by Juana Martinez-Neal. G. P. Putnam Sons,2017. $16.99. Content: G. PICTURE BOOK. Primarily in English, but with several Spanish words thrown in, the fairytale of the Princess and the Pea is retold. El Principe was lonely and wanted to get married, but his mother was very picky about princesses. One day, a beautiful maiden on the way to her castle asks to stay. The mother picks the smallest of peas and demands that several mattresses be Elya, Susan Middleton. La Princesa and the Pea, illustrated by Juana Martinez-Neal. G. P. Putnam Sons,2017. $16.99. Content: G. PICTURE BOOK. Primarily in English, but with several Spanish words thrown in, the fairytale of the Princess and the Pea is retold. El Principe was lonely and wanted to get married, but his mother was very picky about princesses. One day, a beautiful maiden on the way to her castle asks to stay. The mother picks the smallest of peas and demands that several mattresses be brought. The maiden tries to sleep on the mattress, but can’t. She passed the test and married the prince. The prince was quite pleased for he had put pitchforks and stones in the bed. And they have several children after they are wed. The author uses great riming and natural word rhythms that make this a natural read aloud book. The story sparkles with wit and words in both English and Spanish. I really liked the twist of the prince making sure that the princess passed the test. The illustrations have a South-American flare and pair perfectly with the story. This book would be a great choice for story times, particularly bilingual Spanish/English story times. Pre-K, EL (K-3) -ADVISABLE. Samantha Hastings, MA, MLS. Time for a trip South of the Border...way down south to Peru for this retelling of the Princess and the Pea, with a slight twist. In paired rhyming couplets, Elya relays this familiar tale of a young maiden riding her burro on her way to her castle. As she passes through another kingdom, a young prince spots her and decides this is the woman he wants to marry. His trusting mama puts her to the test: to see if she can sleep on a bed of twenty mattresses with a pea hidden under the very bottom one. Time for a trip South of the Border...way down south to Peru for this retelling of the Princess and the Pea, with a slight twist. In paired rhyming couplets, Elya relays this familiar tale of a young maiden riding her burro on her way to her castle. As she passes through another kingdom, a young prince spots her and decides this is the woman he wants to marry. His trusting mama puts her to the test: to see if she can sleep on a bed of twenty mattresses with a pea hidden under the very bottom one. Spanish is sprinkled throughout the text in a red font; a glossary of these Spanish terms can be found in the front of the book to help readers. Illustrations created using acrylics, colored pencils and graphite by Juana Martinez-Neal are filled with the charms, patterns and colors of Peru. I especially enjoyed the Queen, her scowling expression and unibrow. Kids will enjoy looking at the 20 hijos born to the Prince and Princess -- picking out which look like Mama, Papa, and Abuela! 10/11/2017 ~ I read this aloud with a class of first grade bilingual students. So much fun. They were, however, far more interested in looking at the cat in each picture than in the story of the princess. As I did my reading this time, I noticed the guinea pig on each page. Thanks to reading Wedgie & Gizmo, I now know that guinea pigs are important to the Peruvian culture. It's amazing to me how we notice different details with each reading! 11/26/2017 ~~ I loved this variation on The Princes 10/11/2017 ~ I read this aloud with a class of first grade bilingual students. So much fun. They were, however, far more interested in looking at the cat in each picture than in the story of the princess. As I did my reading this time, I noticed the guinea pig on each page. Thanks to reading Wedgie & Gizmo, I now know that guinea pigs are important to the Peruvian culture. It's amazing to me how we notice different details with each reading! This retelling of the Princess and the Pea is muy bueno! The story stays true to the familiar story - princess needs to stay the night, so queen tests to see if she’s a true princess with an unrealistic challenge (pea under 20 mattresses). The twist with this story is that it’s also a spanish primer. Beginning with a glossary (nice touch, it gave the reader a heads up that there were Spanish words to look for) the simple poetic text replaced important english words with the Spanish - printed in This retelling of the Princess and the Pea is muy bueno! The story stays true to the familiar story - princess needs to stay the night, so queen tests to see if she’s a true princess with an unrealistic challenge (pea under 20 mattresses). The twist with this story is that it’s also a spanish primer. Beginning with a glossary (nice touch, it gave the reader a heads up that there were Spanish words to look for) the simple poetic text replaced important english words with the Spanish - printed in red so you knew they were there. The illustrations are delightful, colorful and cultural. This was a fun read. 2018 Pura Belpre Illustrator Award Winner. Engaging, rhyming text, perfect for reading aloud to young children. The illustrations are delightful. I was surprised by the ending -- because I didn't pay close enough attention to the story being told through the illustrations! That's the power of this book. The kind of book children will want to return to again and again - to read both the words and the illustrations. Don't skip the illustrator's note at the end. Her description of how the textiles i 2018 Pura Belpre Illustrator Award Winner. Engaging, rhyming text, perfect for reading aloud to young children. The illustrations are delightful. I was surprised by the ending -- because I didn't pay close enough attention to the story being told through the illustrations! That's the power of this book. The kind of book children will want to return to again and again - to read both the words and the illustrations. A classic tale is given a cultural twist in this retelling of "The Princess and the Pea." La Princesa visits un castillo with un príncipe who is looking for una esposa. The princes madre doesn't like the looks of her, so she sets up a test with veinte colchones y un guisante. A glossary containing a plethora of Spanish words greets readers before the story begins. This is incredibly helpful for those not familiar with the language. Spanish words are presented in bold, red text. The Spanish words w A classic tale is given a cultural twist in this retelling of "The Princess and the Pea." La Princesa visits un castillo with un príncipe who is looking for una esposa. The princes madre doesn't like the looks of her, so she sets up a test with veinte colchones y un guisante. The Spanish words will give this story an additional flair when reading for storytime. Maybe because I just got back from Guatemala, but I fell in love with this book. The spanish, the illustrations, the potential comprehension questions to ask students... Which country do you think this takes place in? What clues in the illustrations make you think that? My students are also learning a little bit of spanish vocab, so it will be fun to see how many words they recognize/can decode/remember. I barely remember the Spanish I learned years ago, but I loved using context clues to figure out what the Spanish words thrown into this mostly English children's book mean. The rhymes helped! Illustrations were cute, intricate, diverse, and I loved the illustrator's explanation of using Peruvian textiles at the end of the book. And there is a twist at the end that makes this version of Princess and the Pea (I never really liked the original tale) different. And better! A clever rhyme with a sprinkling of Spanish words makes this a fun read aloud! Kids will laugh at the twist! Adults will appreciate the detailed representation of Peruvian culture, dress, and textiles. The artwork is enchanting and I appreciated the notes from the illustrator which added historical context and depth to this retelling. It's a nice version of the traditional story. It's a good thing there was a key in the front of the book with the Spanish to English words. I referenced it often, as there are many Spanish words. This makes reading the book take a little longer. Still, nice version. Absolute gold! Caldecott contender for sure! Incredible graphite and acrylic illustrations with style, humor and texture. The rhymes are fresh with the mix of Spanish and English. Truly the gem of 2017. Really glad the decision was made to put the glossary in the front of the book. Read through it well because with this rhyming book, you'll want to know the Spanish words upfront so not to mess with the rhythm of the rhyme. Very fun retelling. And gorgeous illustrations. I LOVED the artwork in this one, and learned quite a few new Spanish words too!